Hi everyone! 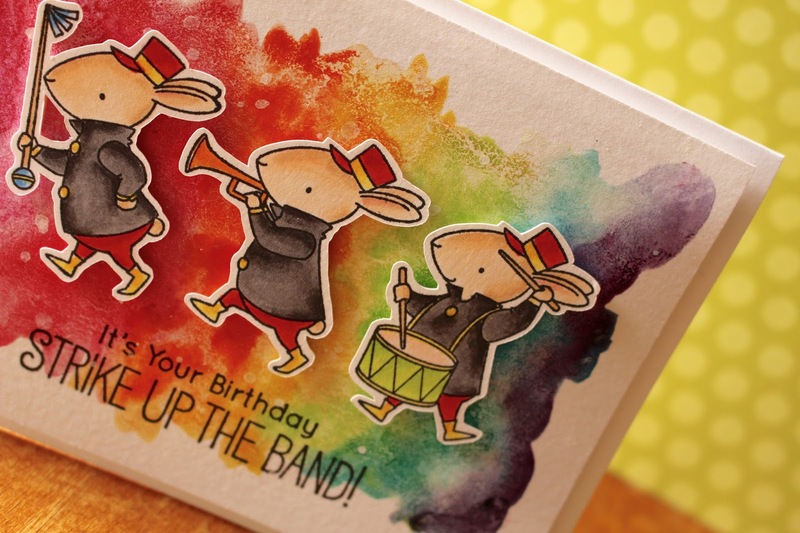 Today I have another video for you guys featuring my new Dr. Ph Martin watercolours along with the Strike Up The Band stamp set by MFT. I used to do rainbow backgrounds so often and I don't do them much anymore, but today I wanted to break out these watercolours and create a fun rainbow background with them. To begin my card I started on the background. I pulled out my Dr. Ph Martin watercolours and chose 7 of the colours to use. I wet my piece of watercolour paper first and then dropped in the colour with a brush. For the green, I didn't have a green in the set I used that would work, so I grabbed a darker green from the other set I owned and then mixed it with the yellow from the previous set I was using. I finished up the watercolour panel working through the colours in rainbow order and then set the piece aside to dry. 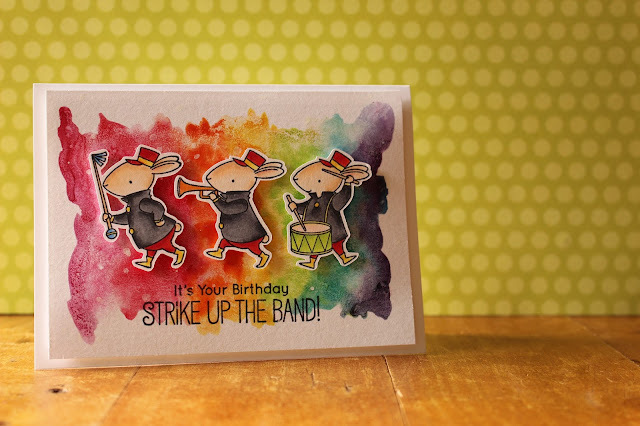 I then pulled out the images of the mice from the Strike Up The Band stamp set and I knew I wanted them to all be facing one way so I chose the three mice that were facing to the left. I placed them all in my Mini MISTI and stamped them on a piece of Neenah Solar White Cardstock. I used various shades and colours of Copic markers and then ran them through my Brother Scan N Cut machine to cut them all out. Once they were cut out I pulled back over my water coloured panel and dried the rest of the way with my heat tool. I then placed the panel into my Mini MISTI and stamped out the sentiment with some Versafine Onyx Black Ink. I could have used an acrylic block but I wanted to make sure my stamped impression was perfect on top of the warped and textured watercolour paper. Once I stamped my sentiment I adhered the mice down with some foam adhesive. I then popped up the panel on some fun foam and then adhered that onto a white card base. To finish off the card I added a little wink of stella for some shimmer.